An unwelcome invader from the south has begun to infiltrate the US, destroying property and reducing income – and this time the blame can be securely pinned to climate change. The southern pine beetle (Dendroctonus frontalis) from Central America, one of the most voracious of tree-killing infestations, has already made itself at home in southern New Jersey and could infect the northern US and southern Canada by 2080. Its destruction of trees in the southeast US cost the nation 14 million cubic metres of timber − worth $1.7billion − between 1990 and 2004. Now it is gaining ground in more northern regions because even though the average increase in global temperatures has so far been modest, there have been significant rises in the lowest of the extreme temperatures of US winters. The beetle can overwinter in the tree bark and make itself at home even in a snowy world, but it cannot survive minimum air temperatures of between minus 14 and minus 20°C. As annual average temperatures in the northeastern US are projected to rise between 2° and 6°C by 2100, with perhaps greater rises in the winter extremes, what scientists like to call “the climatic constraints” that limit such beetle invasions will probably recede dramatically. The destructive insect was found on Long Island in New York in 2014, and Connecticut in 2015. By 2050, 78% of the pitch pine forests of the US north-east, from southern Maine to Ohio, could be at the mercy of the invader. It is predicted that, by 2060, the southern pine beetle will have settled in southern New England and, by 2080, will be able to infect 71% of the red pine and 48% of the jack pine across a vast area of the US and southern Canada. 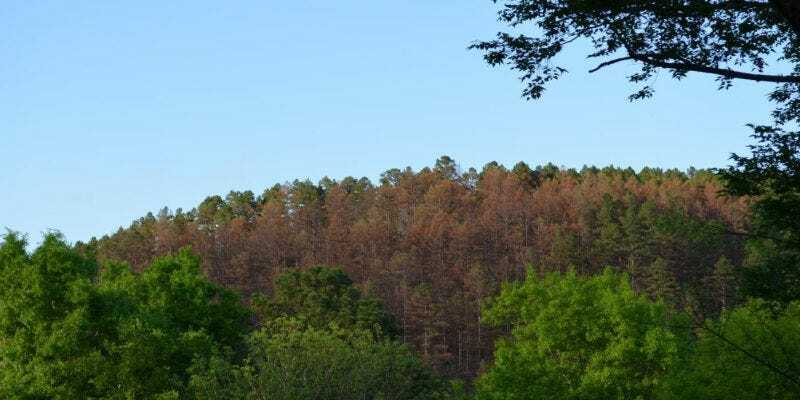 Scientists from the US report in Nature Climate Change journal that they looked at the progress of the southern pine beetle so far, identified the forest stands most likely to be at risk. They then analysed climate change projections likely as humans continue to burn fossil fuels, raise atmospheric carbon dioxide, levels and accelerate the global warming that has already begun to change climates, with milder winters and longer growing seasons. Researchers have repeatedly warned that warmer climates and longer growing seasons will also favor predators and pests. The US northern forests have been shaped by 10,000 years of evolutionary adaptation to accommodate fierce swings in continental temperature, and one benefit of extremely cold winters is that each year these erase many of the natural pests that would hamper plant productivity in the spring and summer. But climate change is on the way, bringing with it disruption to once-stable ecosystems, and uncertainty to farmers in the UK as well as to farmers in the US. In some cases, the concern is driven by the response of the vegetation itself to higher levels of carbon dioxide in the atmosphere, and in others by the impact of global warming on creatures that prey on insects. Some pests have already responded to the rising temperatures by moving to cooler habitats. In other cases, rising temperatures simply widen the horizons for creatures that feed on tree bark, and the southern pine beetle is one of them. The researchers found that the temperature of the bark at which pine beetles become at risk is minus 10°C – bark is always warmer than the air around it − and this minimum has been moving northwards, with the beetle, at between 65km and 85km a decade. Such research presents only a crude set of conclusions: there will be other factors at work to either enhance the beetle’s spread or limit it. But the scientists point out that forests already stressed by heat and drought become more vulnerable − and, as the century proceeds, the periods each year of extreme heat and drought could be extended by between 10 and 20 days. “Our study reveals a plausible new threat from southern pine beetle to vast areas of pine forest in eastern North America by 2050 and into subarctic Canada after 2080 under continued climate change,” the US scientists warn.